Jerusalem, September 7, 2016 — Columbia University has announced that its top honor for achievement in biological and biochemical research will be awarded to two researchers from the Hebrew University of Jerusalem and a colleague from the United States. 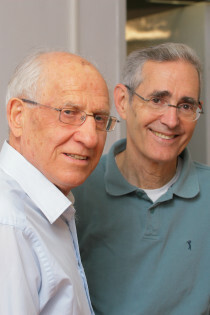 The 2016 Louisa Gross Horwitz Prize will be presented to Prof. Howard Cedar and Prof. Aharon Razin of the Hebrew University’s Faculty of Medicine, and Dr. Gary Felsenfeld of the National Institutes of Health. Since the Horwitz Prize was first awarded in 1967, 43 of the 94 winners have gone on to win Nobel Prizes, most recently in 2014. The researchers will be awarded for their fundamental work on how molecules regulate the structure, behavior, and activity of DNA without modifying its genetic code. Their research has yielded key insights into how cells and embryos develop, and led to the formation of a new field of biology called Epigenetics. Among the innovations attributed to Profs. Cedar and Razin is the concept of epigenetic reprogramming, a key process in development that erases and re-establishes the ability of cells to transform into different types. The awards ceremony will be held in New York on November 22, 2016, following the 2016 Louisa Gross Horwitz Prize Lectures. The Columbia University announcement is at http://newsroom.cumc.columbia.edu/?p=37120. Howard (Chaim) Cedar is an emeritus professor of molecular biology, and the Edmond J. Safra Distinguished Professor (Emeritus), at the Hebrew University of Jerusalem’s Faculty of Medicine. Aharon Razin is an emeritus professor of biochemistry, and the Dr. Jacob Grunbaum Chair of Medical Science (Emeritus), at the Hebrew University of Jerusalem’s Faculty of Medicine. Gary Felsenfeld is a senior investigator of the Laboratory of Molecular Biology, National Institute of Diabetes and Digestive and Kidney Diseases, National Institutes of Health, and an NIH Distinguished Investigator. The Louisa Gross Horwitz Prize was established under the will of the late S. Gross Horwitz through a bequest to Columbia University. It is named in honor of the donor’s mother, Louisa Gross Horwitz, who was the daughter of Dr. Samuel David Gross (1805–89), a prominent Philadelphia surgeon who served as president of the American Medical Association and wrote Systems of Surgery. For more information, please see the Columbia University website at http://www.cumc.columbia.edu/research/horwitz-prize.